An ideal text for anyone studying/ practising the use of systems ideas in its many guises. Edited by Prof. Frank Stowell. In a complex and changing world, current scientific approaches to problem solving have drastically evolved to include complexity models and emerging systems. Breaking problems into the smallest component and examining its position inside a system allows for a more regulated and measured technique in investigation, discovery, and providing solutions. 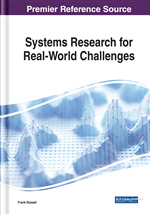 Systems Research for Real-World Challenges is an essential reference source that explores the development of systems philosophy, theory, practice, its models, concepts, and methodologies developed as an aid for improving decision making and problem solving for the benefit of organizations and society as a whole. Featuring coverage on a broad range of topics such as complexity models, management systems, and economic policy, this book is ideally designed for scientists, policy makers, researchers, managers, and systematists seeking current research on the benefits and approaches of problem solving within the realm of systems thinking and practice. Use code IGI50 for price reduction.